In late 2013, Bill Lohse, Bob Wu and I locked ourselves away to focus on how we could do early stage investing in a new and powerful way. We knew that the moment-of-inception and the Series A were the two best places for us to produce return for investors. But how could we do it in a way that would maximize the predictability and scale of our success? We determined that the key issue at the earliest stage is finding the best companies. Sounds simple, but with tens of thousands of new startups worldwide, it is a daunting task in practice. Based on work we had done in our publishing days, testing every single product in the PC revolution, we devised a novel approach: Science. We broke that huge market down into tight focus areas. We would choose 4-5 of those each year (now every six months) and carpet bomb them with research, analytics and outreach so we know every company in those frames, touching a significant percentage of them, and building up huge context to drive a set of early stage investments inside the selected frames. The result, we felt, would be a set of companies highly more probable to make it to their A rounds than others. To this intense moment-of-inception approach, we added the concept of always taking pro-rata rights in those early investments. This addresses the primary challenge at the Series A: getting into the best rounds. By the A everyone knows what companies are performing well; finding them isn't the issue. Access is. With our pro rata rights we are guaranteed access to the A rounds of our best companies. These ideas drove our unique two-fund structure (Moment-of-Inception funds and A Round funds) and our uniquely scientific approach to early stage investment. We operate like an index fund of the best brand new companies that leads to a managed fund of the development-stage winners. 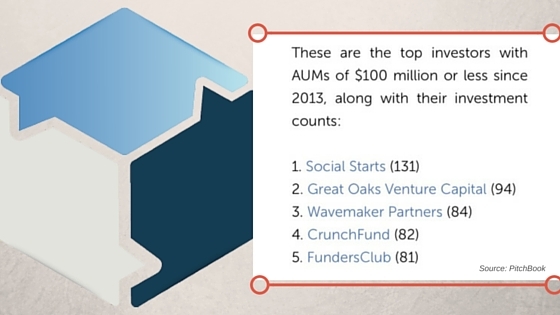 Last week we were delighted to see that Pitchbook named Social Starts the Top Investor under $100M since 2013. Looks like the plan is coming together nicely.